I saw a pair of 5000's laying in the Howard Yard on Tuesday. Both have the CTA logo pasted on the front end of the cars, and the blue material on the front of the cars (so it may not look like the 3200's after all). Thats cool I saw a 8 car series of 5000's on the Blue Line 12/14/09 I was driving my bus when I seen them heading westbound. In im opinion they are a mixture of 22's 26's and 32's I cant wait till theyre in serive hopefully the Green Line can get the 2600 series again. I got a great shot of one a few weeks ago and posted it on Flickr. The end wrap was sort of interesting, but obviously not permanent. I love the 3200s, I lov it that they are a cross of 2600s and 2200s. Whoever came up with that idea should be fired. Talk about gaudy, that big logo on the side as well as the logo on the front door. I could live with the blue, but the rest has to go !!!!! Of course, when I saw it the first time, it didn't have that ridiculous "CTA logo" on the door...upon further review, I'd like to say "throw it back!" I guess I don't have the adverse reaction the rest of you did. It is sort of reminiscent of the Pace wrench interrupted by the windows, which I guess is also an acquired taste. We don't have a definitive interior shot confirmation yet, but if they best they could do is ape the 3200 longitudinal test car, that isn't too imaginative. They should watch some home decorating shows on the Create channel. If your looking for interior shots there's this. As far as the new ends there testing I kind of like the sides with the big logo on it, but don't care for the ends. It kind of gives it, it's own character. If it is successful I wonder if it will make it to the buses as well. If your looking for interior shots there's this. In a related matter, the only thing in Hilkevitch's column today that made much of any sense (as far as the CTA is concerned*) is that office rumor was that people after Huberman spiked Huberman's recommendations for aesthetic changes. Hence, we get cars that look essentially the same as the 3200s, even though, as the post to which you linked indicates, there was room for wider seats. *The stuff about the cars being delayed for 2 years for that reason is pure hokum, since the CTA documented on its site that the real reason was that it had to respecify AC traction to get any bids. 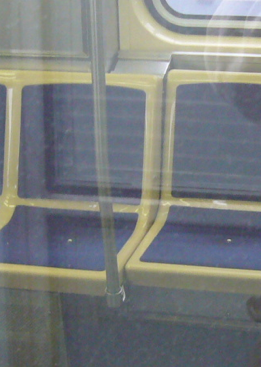 Could CTA at least manage to properly line up the damn seats? I can't tell from the reflections, but that seem like the place where the heater box is (and hence had longitudinal seats since the 2400s). Of course, the answer is no, in any event. Ive always hated the tanish brown color of the railcars. Make them look so dreadful. Wonder why they couldnt have gone with an interior similar to the stimulus buses. If you look on chicago-l.org and look at the 3200 series gallery you'll come across a pic of the old 6000 series and 3200 series at midway station. The 3200 series cars were designed to look like the 6000 series cars if you look at both sets you can see alot of similarities not including the sides which resemble the 2200's. Just a f.y.i about the 3200 series. That looks terrible, It makes it look like the car was in an accident. I suppose they could but then all of that standing room would be eliminated and everyone standing would be squished together. You would still have a couple of inches between the seats and the windows on each side. To properly "align" the seats could get you some close up crotch looks. I for one do not look forward to that. My question is when will the 5000 series actually be put in service??? Does testing really take that long?? and do anybody know exaclty which train series is going to be on which line after the retirement of the 2200 and 2400 series rail cars? Just wondering. Testing will probably be through the winter, to see if the snow or ice clogs or shorts out anything. Personally, I don't see all the body measurement against platforms testing, since the bodies seem the same as on the 3200s, but maybe that has to do with the self-levelers. The answer to the latter is that Frank Kruesi claimed to have known, but that's two Executive Directors [sic] ago. However, his saying the Blue Line still seems to make the most sense. In that nearly everyone who tried to predict at the beginning where the NF buses would go eventually was shown up, it probably does not pay to guess again with respect to the L cars. According to Rodriguez, the cars need to be in testing for 4 seasons before they are placed in revenue service. Since it seems that Chicago only has 2 seasons (Summer and Winter), they may come online sometime next summer. 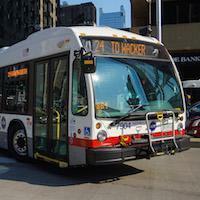 5000's are testing on the Red Line today. 8 cars were heading north at Berwyn at 11:45am.